With LogicSim you can design and simulate digital logic circuits with logic gates like AND, OR, FlipFlop, etc. 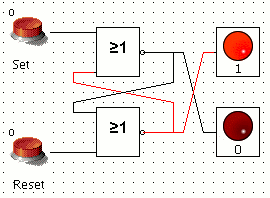 You can create your own gates by saving a circuit as a "module" and reuse this module in another circuit. The Switch element can now be configured to be a traditional toggle button or a click button, which ist only on as long as the mouse button is held down. Added support for text labels anywhere in the circuit. Place the text label object and edit the text with context menu -> properties. Use \ (Backslash) to insert a line break. To start LogicSim, extract the archive content and double click on LogicSim.jar or run "java -jar LogicSim.jar". This program is free software released under the GNU General Public License. To run this program you need at least version 1.4 of the JAVA Runtime Environment. 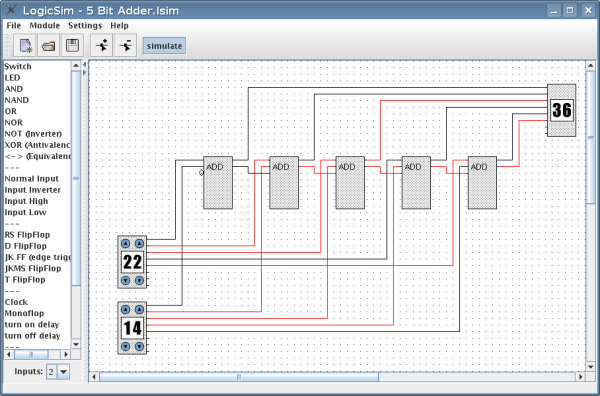 Simulation of a 5 Bit Adder with decimal input/output. 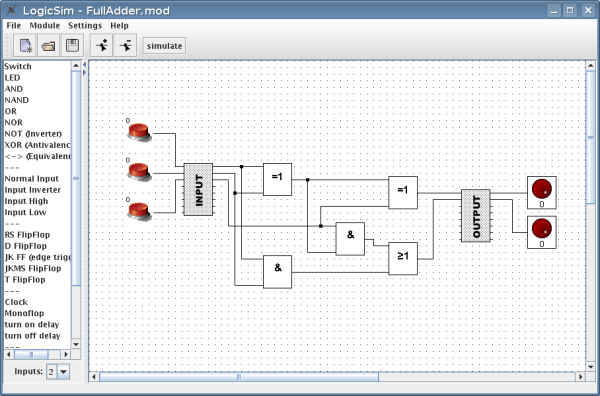 The Full Adder module used in the top circuit.